Not happy with your internet speeds? Worried about it getting worse? There's a simple solution: Just move to the Moon. Researchers just beamed Wi-Fi there, and the connection is probably faster than anything you've got in your neighborhood. 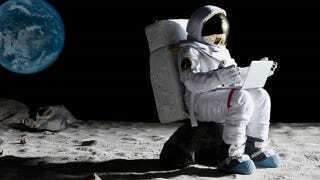 Moon Wi-Fi has been a long time coming, but researchers at NASA and MIT have now made it a reality. Using four 6-inch diameter telescopes to beam pulses of infrared light to a satellite circling the Moon, scientists established a solid connection with a speed of 19Mbps down. Yes, that's faster than the United States' national average.